Fall is suddenly upon us with cooler temperatures, shorter days, and finally some rain. It has been raining all day today, true to the weather predictions which the past couple weeks have not held, at least in my neighborhood. So we were pretty dry until now. I finally gave in to reality and decided to get caught up on indoor chores, rather than go out on the migrant quest. But over the past week there have been birds arriving at the two spots I can visit regularly downtown, 155 North Wacker Drive on my way in to work and Lake Shore East Park on my lunch hour, in particular on Friday after the cold front pushed more birds down to us. 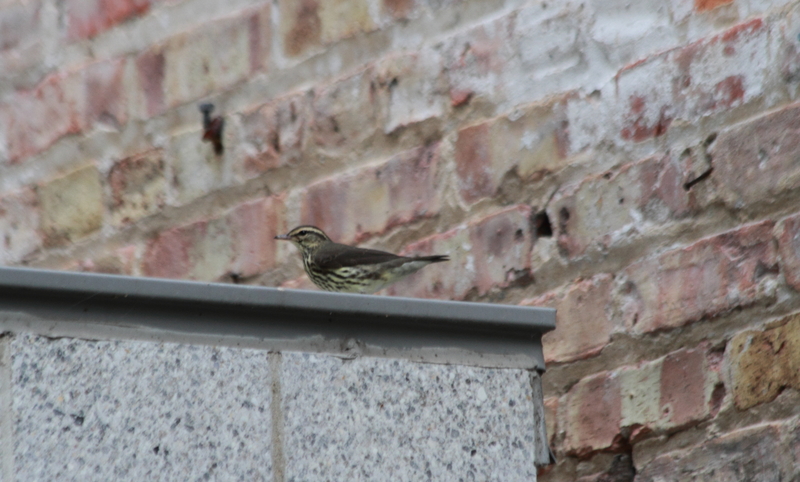 At 155 North Wacker I never know where I’m going to see birds, so the waterthrush flew up onto the top of a wall on Wednesday, and on Friday, the Tennessee Warbler was stuck inside the deli. I called the Chicago Bird Collision Monitors without realizing I had not told them exactly where I was but by the time they got there the worker inside the deli whom I had been trying to help get the bird down and out the door managed to catch the warbler in something net-like, brought it out to me, and as soon as I could say “it’s fine” the Tennessee escaped his hand and flew into the trees. I would have rather gotten a picture of him free, but he was not having anything to do with us after all that. Redstarts have been most abundant. Of course this time of year a lot of them look more like Yellowstarts. The first year males are distinguishable from the females such as the one above by their more brightly-colored feathers and the prescient orange look to the yellow on the side of the breast. The young male below was a bit puffed-out looking through a lot of the shots; I hope he’s feeling better. 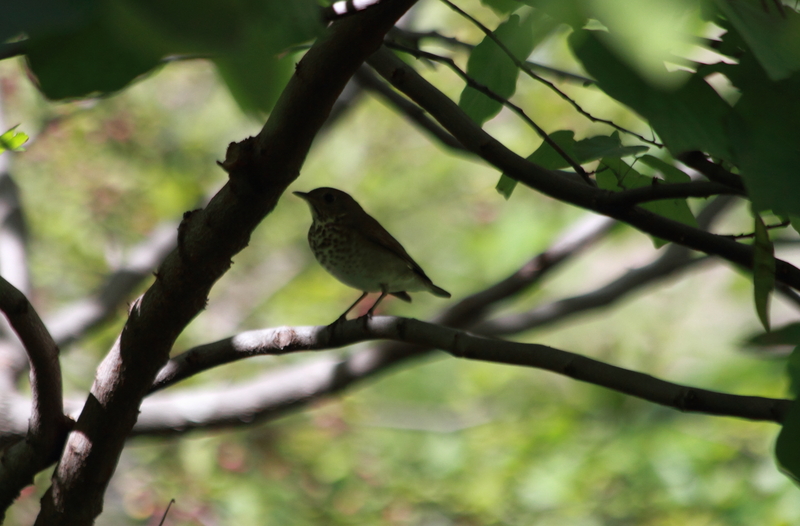 Swainson’s Thrushes have also been here and there. Not as many as I would have seen in the larger park space but still you could pretty much count on seeing or hearing one somewhere. 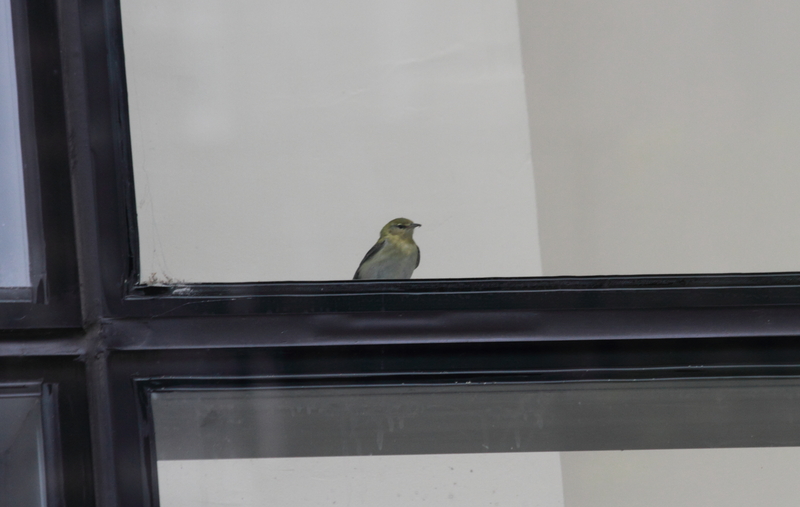 Below is a not great picture of what may be the first Blackpoll I’ve seen this fall. 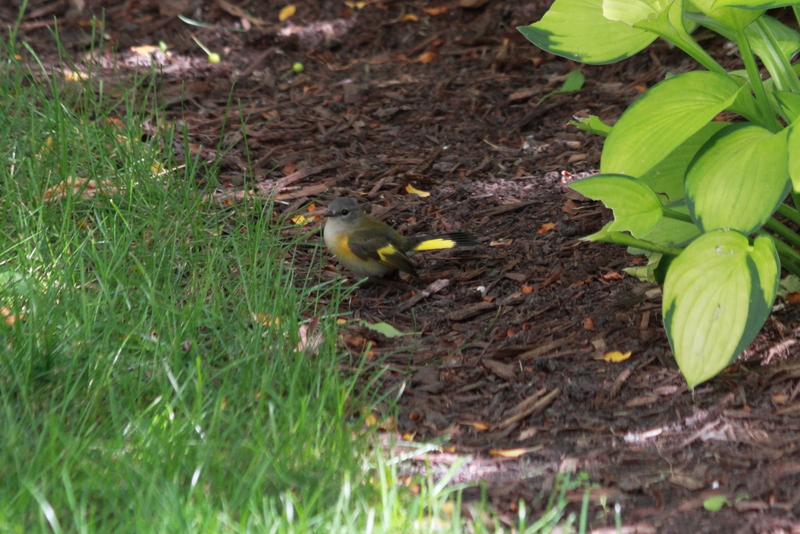 There were other shots that fill out the whole bird a bit more but none as revealing. 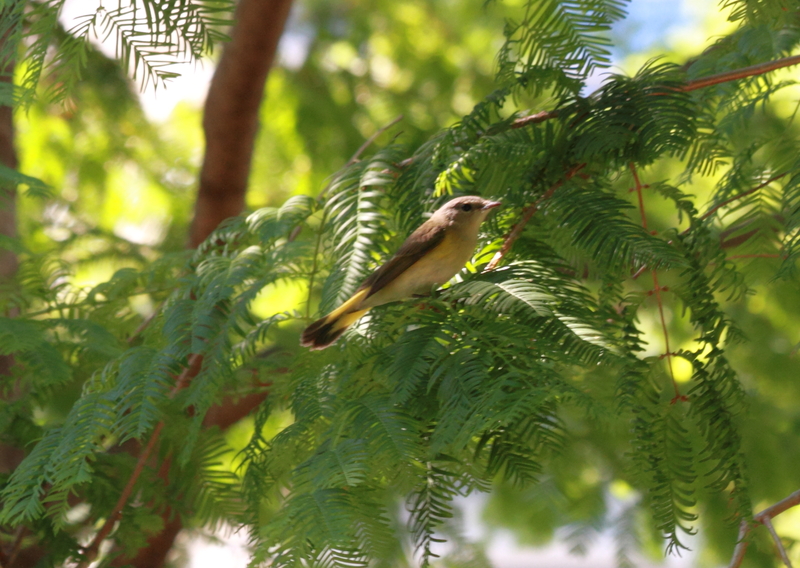 That’s one thing about taking pictures of warblers. You might end up with the tail feathers in one picture and the breast or head in another. Or you might just get a good look at the underside. 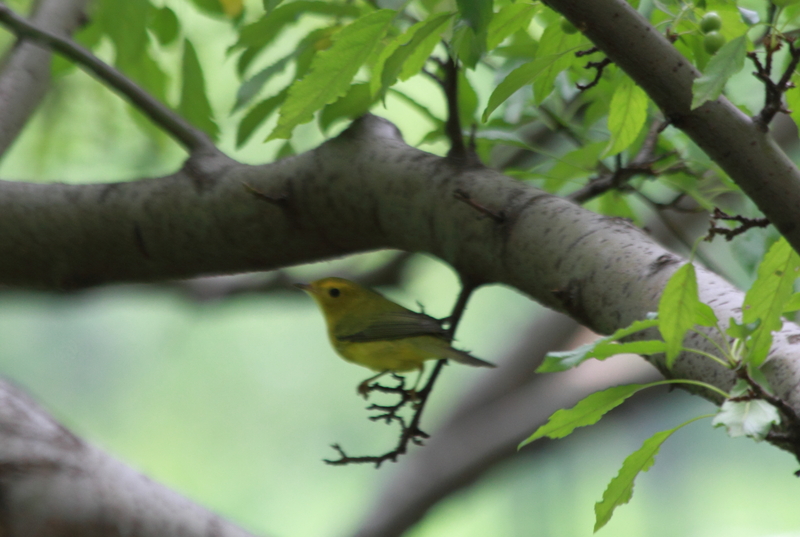 Below is a Female Wilson’s Warbler. Again not a great picture but a nice bird to see, nevertheless. 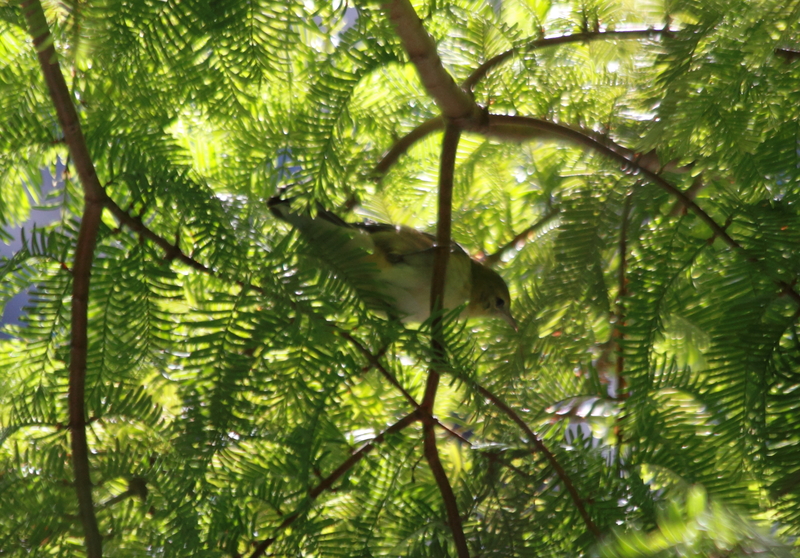 Friday there were at least a dozen Palm Warblers foraging in the grass and in the trees in Lake Shore East Park. 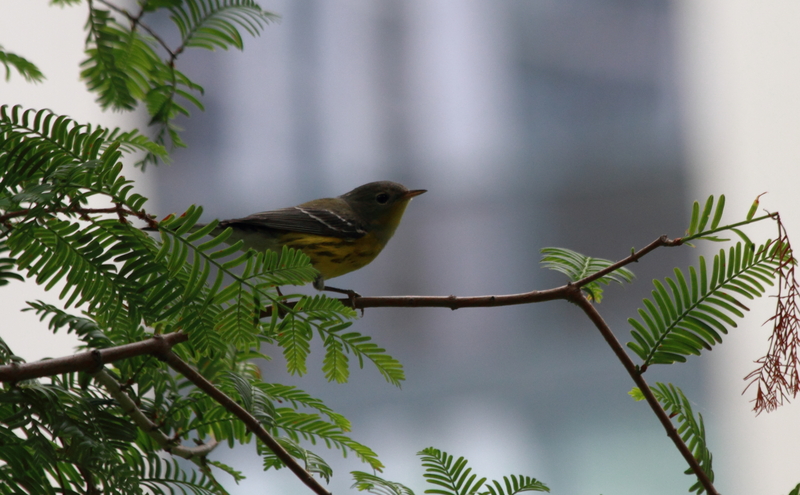 The third most common bird has been Magnolia Warbler. Below is what looks to me like a nice first-year male. If I can get up early tomorrow I might try the lakefront before work. If nothing else, I owe my crows a visit. 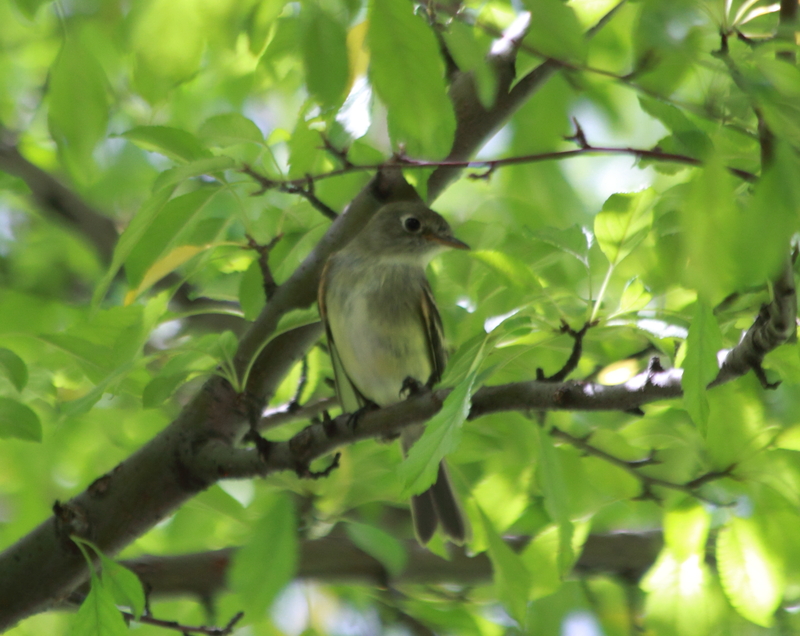 This entry was posted in birds, photography, Warblers and tagged 155 North Wacker Drive, American Redstart, Blackpoll Warbler, Chicago Bird Collision Monitors, downtown Chicago, fall warblers, Lake Shore East Park, Magnolia Warbler, Northern Waterthrush, Palm Warbler, Swainson's Thrush, Tennessee Warbler, Wilson's Warbler, Yellow-Bellied Flycatcher by Lisa Rest. Bookmark the permalink. Thanks, H.J. I try to make as many people as possible aware of Bird Collision Monitors especially when they work at these locations. I’ve heard of the risks of bird collisions and the numbers are so frighteningly high…. do you ever see evidence of this or is it not always that big of a problem? Window strikes are a terrible problem. I don’t personally see that many dead birds but I am sure the monitors do as they are out a lot earlier than I am and they know which buildings cause the most trouble. 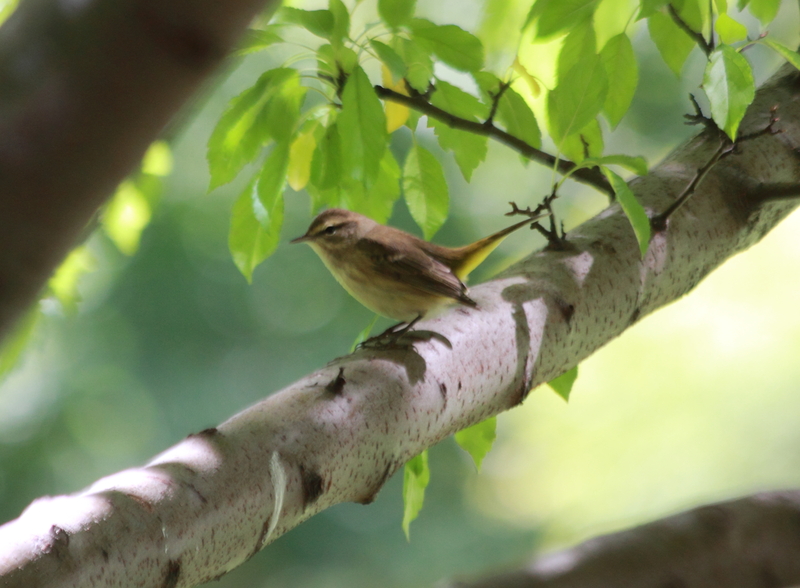 Passerines migrate at night to avoid predation, but they can be confused by ambient light from skyscrapers, so many cities including Chicago have been turning out lights at night during migration. But during the day windows create a problem too as they reflect the sky or trees and a bird, which does not have binocular vision like we do, can think it’s flying into a tree or more sky and hit a window. I have picked up stunned birds and carried them off to a safer habitat when they were okay to be released. I have also found dead birds and turned them in, because the Field Museum keeps track of them and also uses some less damaged specimens for skins. That’s really a sad situation. I hope someday a solution can be found. Nice catches. Especially like the pics of the redstarts. Do you think the orioles have already left the area? Thanks, Jason. And welcome back! I think the orioles are gone. I saw my last a couple weeks ago. Fall sparrows are starting to come in now. I just had White-Throated and first-year White-Crowned Sparrows at Lake Shore East Park this afternoon.